Biotech and pharma investors can breath a huge sigh of relief. On Wednesday, the latest annual Medicare trustees report revealed a drug-pricing panel — the Independent Payment Advisory Board (IPAB) — won’t be formed until next year. 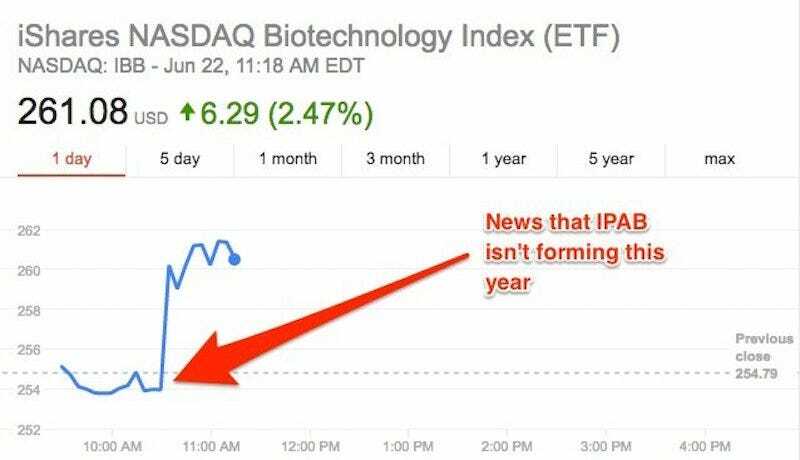 This news sent biotech and pharmaceutical stocks surging as many investors feared the IPAB would form a year earlier than expected. The committee is expected to put a lot of pressure on drugmakers, which could see a sharp reduction in payments received from drugs covered under Medicare, which have been on the rise. Medicare funds are expected to run out by 2028, a full two years earlier than Medicare trustees anticipated a year ago. Pharmaceutical and biotechnology stocks have taken hits over the past year as companies face criticism over drug pricing. Year-to-date the ‘IBB’ biotech ETF, which tracks the value of biotech stocks, is down more than 23%. And according to Bloomberg, IBB had been down 11 of the last 12 trading days through Tues.
Here’s what the Nasdaq biotech index looked like right after the Medicare trustee announcement.